The Civil War saw our country split in two—North and South, Union and Confederate—but regardless of who was right, both sides were fighting for their beliefs, their families, and their way of life. It’s impossible to look at it as good guys vs. bad guys because it isn’t that simple. Good men fought and died on both sides of the battlefield, and it is only right to honor them. That is why Gettysburg features statues of both Union heroes, like the Pennsylvania State Memorial, and statues of Confederate heroes, like The Virginia Monument. The Virginia Monument was the first of the Confederate monuments to be built at Gettysburg, and it remains the largest. It was commissioned on March 9, 1908 and cost $50,000, which, in today’s money, is the equivalent of $885,000. That’s pretty expensive! It towers forty-two feet above Seminary Ridge, just East of Spangler Woods and accessible by West Confederate Ave. The primary sculpture is a 14-foot bronze portrait of General Robert E. Lee, mounted upon his horse Traveller. 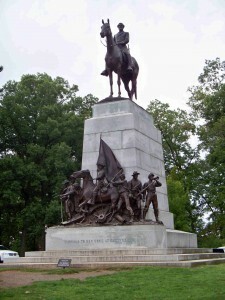 Lee rides high on a 28-foot granite pedestal with seven Confederate soldiers beneath him. Their bronze eyes survey the field before them: site of the famous infantry assault of Pickett’s Charge. On the other side of the field is Cemetery Ridge, where the Union lines made their stand. There, a statue of General George Meade meets Lee’s gaze. The seven Confederate soldiers, according to sculptor Frederick William Sievers, are representative of the men of all walks of life who left home and trade behind to serve in the military. First, there are two riflemen, one symbolic of a professional man, the other a mechanic. Beside them, a man who was an artist now aims a pistol. In the center, a boy on horseback raises the Confederate flag. To his right, a businessman swings a bayonet, a farmer raises a rifle, and a youth sounds a bugle call. These smaller portraits remind us that they were more than just soldiers. The monument, minus the sculptures, was installed in 1913 and dedicated at the Gettysburg reunion—the 50th anniversary of the battle, which saw over 50,000 veterans gathered together from both sides of the war. The completed statue was unveiled in 1917 by Miss Virginia Carter, General Lee’s own niece, and presented by Henry C. Stuart, the governor of Virginia. To visit this remarkable piece of history, plan your trip to Gettysburg Battlefield Tours today! Posted in Feature Stories, Interesting History, The Civil War, Things To Do and See and tagged civil war, Civil War Memorials, Confederate, Gettysburg Attractions, Gettysburg Memorials, Robert E Lee, Virginia Monument on October 18, 2011 by jamessear.